If you have several different departments who contribute terms to your terminology database, you might run into the occasional difference of opinion. For example, your techdoc team hates the term "awesome" and thinks it should be deprecated. However, the marketing team loves this term and has it set to preferred. What to do? 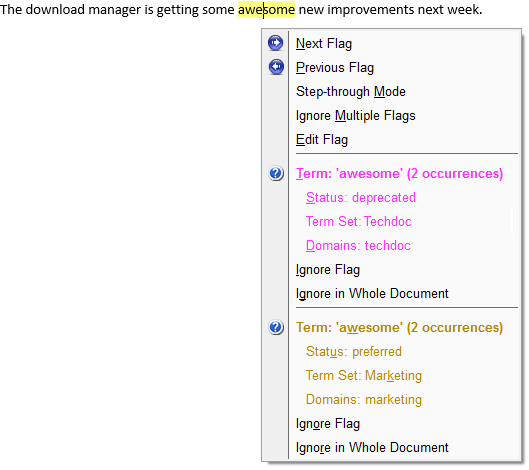 The techdoc team might add the deprecated term "awesome" to the "techdoc" term set. The marketing team might add the same term as "preferred" to the "marketing" term set. Beatrice is writing a product announcement for the website and wants to check with both "techdoc" and "marketing" term sets. Beatrice also really wants to write "The download manager is getting some awesome new improvements next week" . Now, this doesn't necessarily mean that she'll know what to do. If she's sure that her content is a bit more marketing than techdoc, than she can choose to ignore the flag. However, we recommend giving your writers a bit more guidance on what to do when this happens. One way to do this, is to create a "Usage Guidance" custom field, and send it to the plug-in shortcut menu .